A modular design of bioengineered brain-like cortical tissues. 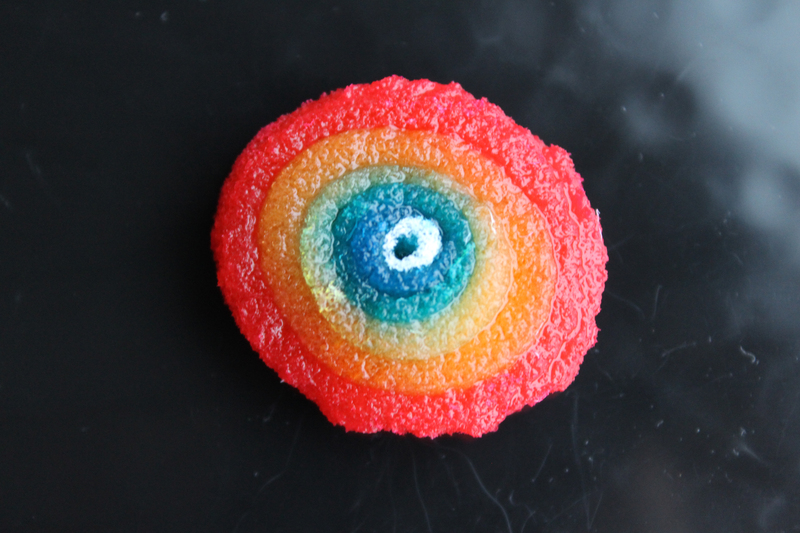 The approach consisted of a modular design of silk protein-based porous scaffolds dyed with food color. Each layer was seeded with different primary rat cortical neurons. 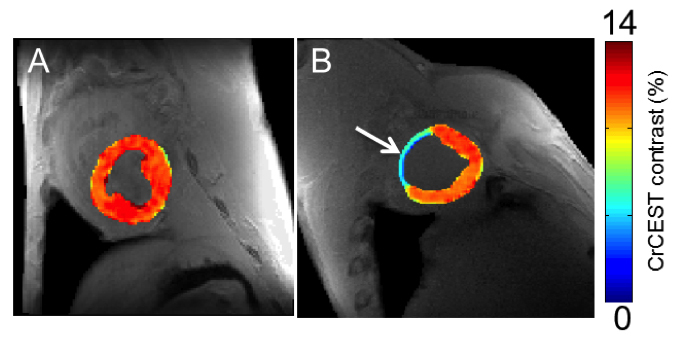 Changes in creatine levels detected using CEST MRI are mapped onto anatomical images of pig heart tissue. Panel B shows decreased creatine levels (blue) in an area that corresponds to tissue death, as indicated by the arrow. 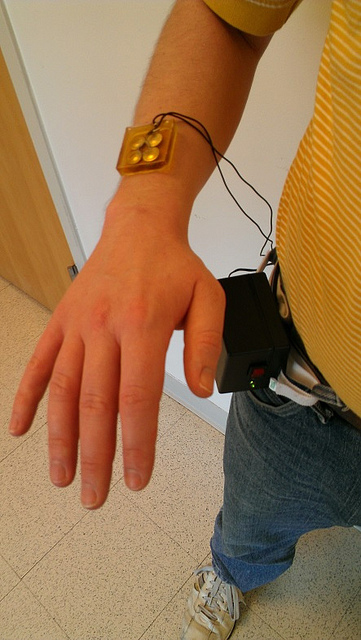 A battery operated patch that is worn like a Band-Aid delivers therapeutic ultrasound to heal venous ulcers. 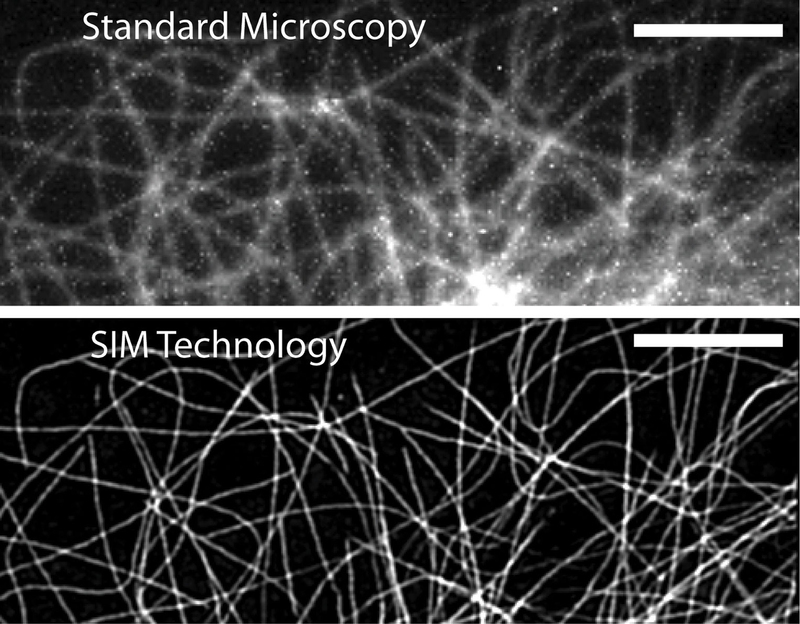 The resolution difference between standard microscopy (top image) and structured illumination microscopy (SIM, bottom image) can be clearly seen. SIM microscopy has been reinvented by NIBIB researchers and allows real-time, 3-D super resolution imaging of small, rapidly moving structures such as blood cells. 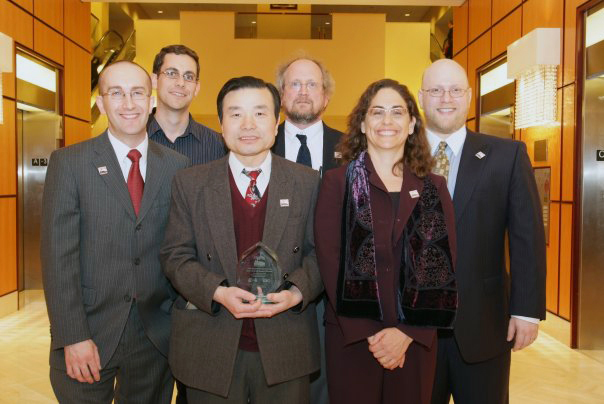 NITRC wins 2009 Excellence in Government Award. Front row l to r: David Cassidy, James Luo, Nina Preuss. Second row: l to r: Christian Haselgrove, David Kennedy, Daniel Turner. 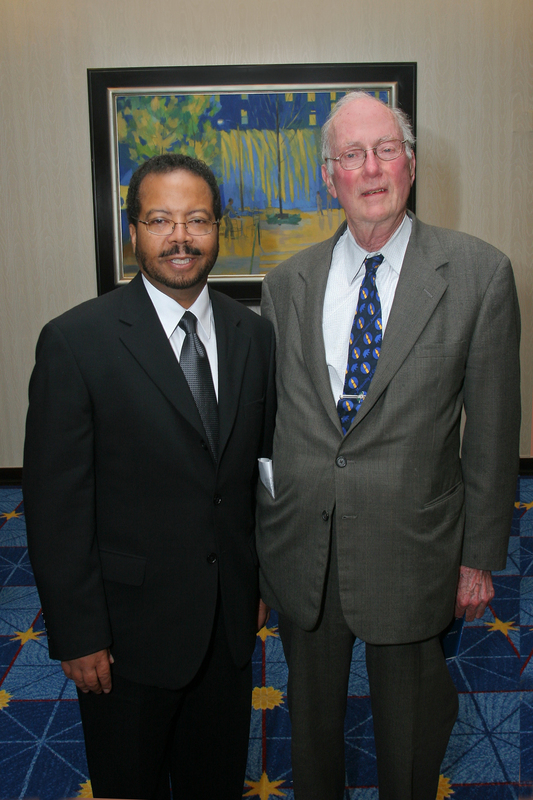 At NIBIB's 5th Anniversary Symposium, held in June 2007, NIBIB Director Dr. Roderic Pettigrew (l) chatted with special guest speaker Dr. Charles Townes, recipient of the 1964 Nobel Prize in Physics for his discovery of the laser. 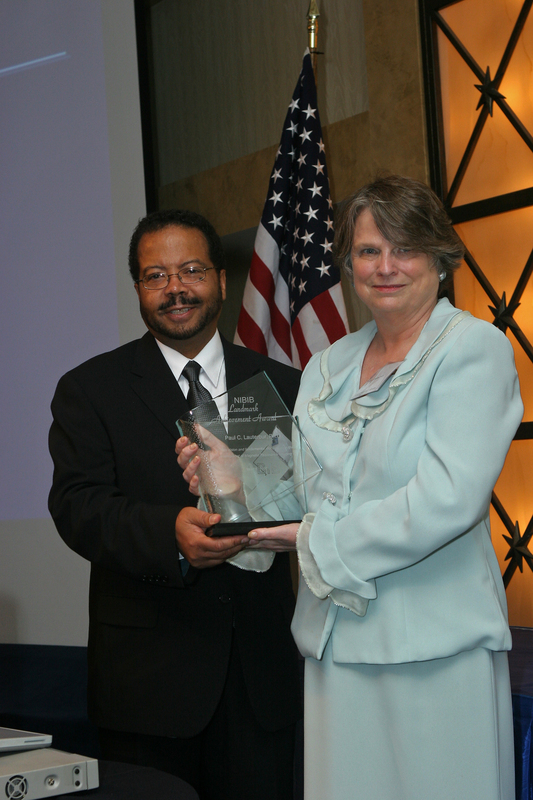 In June 2007, NIBIB Director Dr. Roderic Pettigrew (l) presented the first NIBIB Landmark Achievement Award to M. Joan Dawson, wife of the late Dr. Paul Lauterbur. As a 2003 Nobel Laureate in Physiology or Medicine, Dr. Lauterbur was recognized for his pioneering contributions to the development of magnetic resonance imaging. 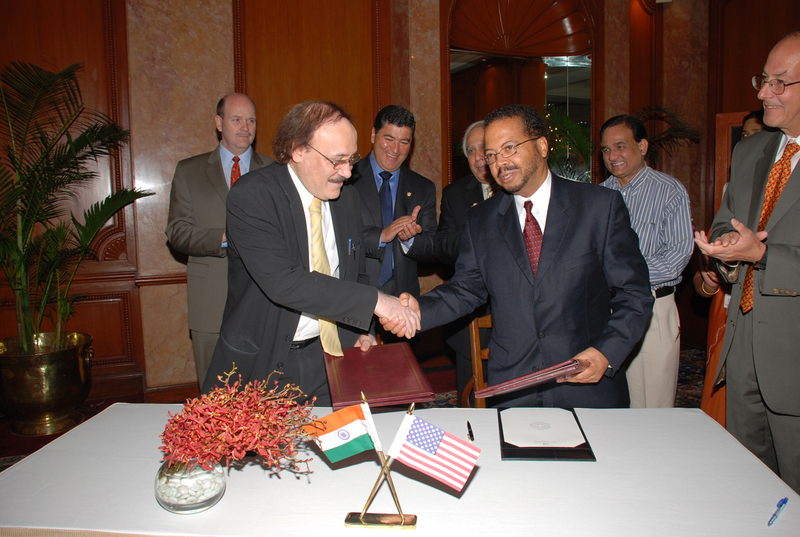 At a meeting in New Delhi, Dr. Maharaj Bhan (l), Secretary of the Republic of India's Department of Biotechnology, Ministry of Science, shakes hands with NIBIB Director Dr. Roderic Pettigrew following the signing of a bilateral agreement in 2007. Witnessing the occasion (left to right) were Steven White, Deputy Chief of Mission, U.S. Embassy, New Delhi; Elias Zerhouni, NIH Director; Kapil Sibal, Science Minister; T.S. Rao, Medical Biotechnology Group Leader; and Roger Glass, Director of NIH's Fogarty International Center.